#146. Canon of Lodore - Uinta Range - Colorado. 8.5 x 6, chromolithograph. Title on plate. This image is Plate V in Clarence King's Systematic Geology, published in 1878. It is based on an oil sketch by Gilbert Munger. He was guest artist with King's 40th Parallel Geological Survey in 1869 and 1870. Lodore Canyon contains the Green River as it parallels the Utah-Colorado border. 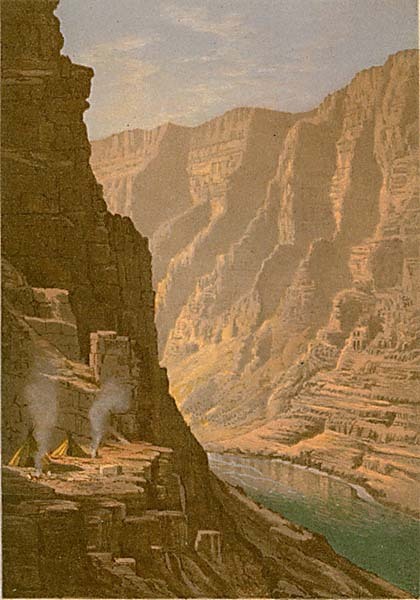 The picture probably depicts the small portion of the canyon that just nudges into Colorado, as claimed in the title. The plate is similar to the Survey photo shown at the right taken by Timothy O'Sullivan when he visited the canyon in November of 1872. (The photo is No. 214 in the Catalog Raisonne included in Timothy H. O'Sullivan - The King Survey Photographs by Davis & Aspenwall, distributed by Yale Univ. Press, 2011.) 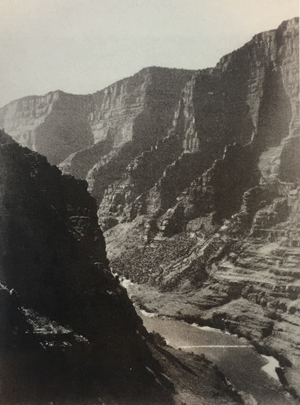 Since we have not yet discovered documentation that Munger visited Ladore Canyon, some have suggested that Munger made his "sketch" from the O'Sullivan photograph. 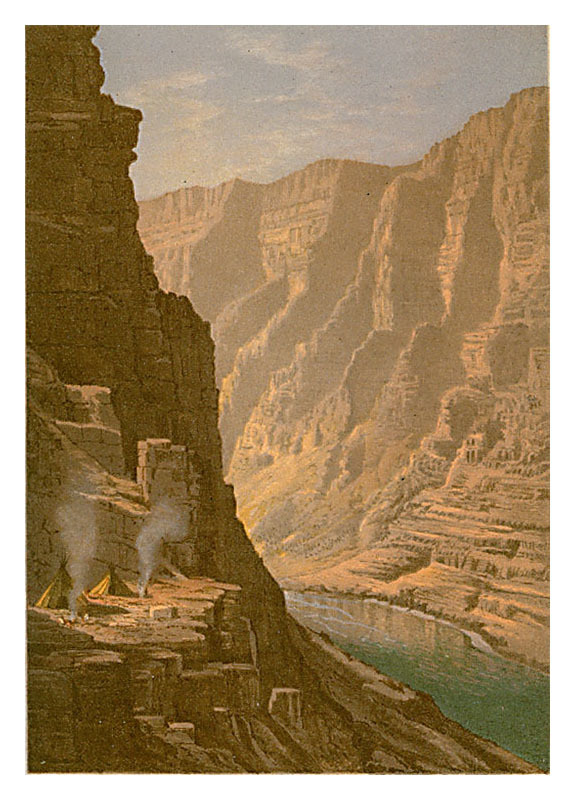 But you can see that the plate and the photo depict views made from slightly different perspectives: the artist is stations further from the buttress on the left canyon wall than the photographer, by a noticeable distance, as indicated by the way the left and right walls of the canyon align differently in the two images. Munger was probably here. We just do not know when. QFD 40. Image is a direct scan of the plate.